The term "Less than zero"
"Less than Hero" is the fifty-eighth episode of Futurama, the fourth of the fourth production season and the sixth of the fifth broadcast season. It aired on 2 March, 2003, on Fox. 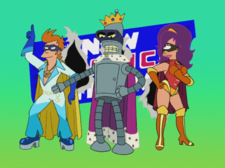 When Fry and Leela discover a mysterious cream that gives them unusual powers, they form a superhero team along with Bender. 1.1 Act I: "Ready for your big trip to the surface?" 1.2 Act II: "Attention, all crooks, lowlifes and lawbreakers!" 1.3 Act III: "Mom, Dad - I'm Clobberella!" Act I: "Ready for your big trip to the surface?" Leela's parents are going to visit the surface the next weekend, and as they are mutants who are not allowed above ground for legal reasons, Leela visits Citihall to get them special one-day surface permits. Meanwhile, the Professor, who has gone temporarily insane, is getting a supercollider from πkea, which turns out to be exhausting to assemble - Fry and Leela are sore all over and receive treatment by Zoidberg with genuine Miracle Cream. The supercollider super explodes, and the Professor asks Leela and Fry to take it back. On the way to return the collider they are attacked by a mugger who attempts to kill them, but are able to defeat him with powers usually not found with humans. They find out that the Miracle Cream temporarily causes superpowers in humans, including invulnerability, super strength and "lickety speed". A fourth power, the ability to command the loyalty of sea creatures, is not expressed and Zoidberg refuses to obey them. As they have super powers and are Americans, they decide to form a team of super heros, including Bender who provides the costumes and as a robot already has some sort of super powers. They choose appropriate names: Fry becomes Captain Yesterday, Bender is Superking and Leela chooses to be Clobberella - thus the New Justice Team is forged and fights crimes all over New New York. The team becomes well known but all three are anxious to protect their real identities, although sometimes Fry needs reminding. Act II: "Attention, all crooks, lowlifes and lawbreakers!" In civilian guise, the crew returns to Citihall pick up the special one day permits for Leela's parents. While they are talking with the Mayor, he learns of a dastardly plot. He uses a secret button to call for the New Justice Team, so they have to make a quick exit to reappear in their super hero costumes. The Mayor warns them that at precisely 9 A.M. tomorrow, the Museum of Natural History will be robbed by the super villain Zookeeper and his gang of highly trained animals. Their target: the priceless Quantum Gemerald. Leela makes good use of the timing, and arranges for her parents to meet her at the museum at 10 A.M., an hour after the robbery. The next morning the Zookeeper and his gang turn up an hour late. The New Justice Team foils his attempt to steal the Gemerald, but the Zookeeper escapes while they are protecting it. Leela's parents witness the action, but since she is still in costume she cannot talk to them without revealing her secret identity. They return to the sewers disappointed, thinking their daughter is too ashamed of them to meet in public. Act III: "Mom, Dad - I'm Clobberella!" Seeing their disappointment, Leela visits her parents in the sewers to offer an excuse. Her attempts backfire, and further anguish her when her parents see through her excuses and suggest they fully understand her shame. She's finally guilted into revealing her secret identity. Morris's bragging inadvertently reveals the team's identities to the Zookeeper, who kidnaps Leela's parents to coerce the New Justice Team into stealing the Quantum Gemerald for him. This is complicated by the fact that they have run out of Miracle Cream, and they have to pull off the heist without their super powers. They deliver the gem to the Zookeeper, and Leela's parents are released. As they have now committed a crime and are out of Miracle Cream anyway, Bender and Fry commit a few more crimes under the cover of their super hero identities. The phone number of Leela's parents is 1566. This could just be the last four digits of the number. Assembling the supercollider requires a hammer, a screwdriver, and a bending unit. Bender uses his left hand as a circular saw. The binary that pops up when Bender is punched by the kangaroo translates to the letter J. The logo on Clobberella's Torso is a reference to the Hammer and Sickle of Communism. The "sickle" is a sweeping arm holding a kitchen rolling pin (the "hammer"). This was in the DVD commentary. SewerCom is a reference to SkyCom. πkea is a spoof of Ikea, a Swedish furniture manufacturer known for its do-it-yourself products that are sometimes shoddy or missing the parts required to assemble it. The "ability to command the loyalty of sea creatures" power that Leela surmises she and Fry have gained (and ultimately they do not have) is a nod to Aquaman, who is (in)famous for having this as one of his main abilities. The song at the end credits names "Superking, Clobberella, and all the rest" even though there was just Captain Yesterday left. This may be a reference to the original Gilligan's Island theme, which names all the characters and then "the rest" even though only the Professor and Mary Ann are left. The same reference is made in "Rebirth". The title caption for this episode says that Futurama is "soon to be a major religion". Star Trek, which is referenced in nearly every episode, will be revealed to have become a religion centuries ago in "Where No Fan Has Gone Before". Superking's crown looks suspiciously like the one Bender stole from the statue in "A Bicyclops Built for Two". Two mermaids, presumably from the "The Deep South", are seen as Fry chases down the purse snatcher. The Zookeeper's gigantic, land-walking piranha is seen wearing Dr. Wernstrom's patented reverse scuba suit, sans the rubber suit and air tank (which would have obscured its menacing piranha visage otherwise). This suit was first seen in "A Big Piece of Garbage". The Street Thugs from "The Honking" was shown for a brief moment in this episode. Hermes: While you're there, could you pick me up a license to kill? Hermes: Uh... what does piano wire count as? Leela: Let's see. Which super powers do we have? Super-strength? Leela: Yes, sir! Ability to command the loyalty of sea creatures? Fry: Hey, Zoidberg! Get in here! Leela: Wow, super powers! I'll be able to pack my day with twice as many humdrum activities! Fry: Whatever. The correct answer is to be a superhero! We have super powers, and we are Americans. This is our chance! Leela: Hmmm. I've been looking for a way to serve the community that incorporates my violence. Let's do it! Fry: You'll barely regret this. Bender: Nine, ten... A big fat hen... [Puffs cigar.] The name's Bender. Leela: Oh, no. I completely forgot. I left my apartment on fire! Professor Farnsworth: Good news, anyone! On the πkea box is the letter ø, which is an independant vowel in Danish, Faroese, and Norwegian. This is actually a common mistake in portraying any written Scandinavian language. However, by the 31st century present-day languages will have evolved. When Fry and Leela are pulling the supercollider, they are mugged. However, when the small robot threatens them, the supercollider disappears. In the scene where the Zookeeper throws the Gem off the second floor balcony, Leela yells out "No, Fry, you can't fall fast enough! ", which brings up the question of how his identity, as well as the others' identities were not revealed. It may simply have been no one was focused on Leela at the moment. When the New Justice Team is fighting the Zookeeper and his animals in the museum, the clock switches between displaying 9:35 and 10:00 (the correct time) several times. In the scene where the heroes come to save Leela's parents, the Zookeeper's bird's tail is changing in length. The Cream doesn't mention invulnerability amongst the powers gained, but Fry and Leela do gain it. Super strength could include super strong skin that would resist even being blasted by a laser gun. Fry's shirt isn't damaged when he is shot, despite it apparently being ordinary fabric. The Mayor states the Quantum Gemerald is worth slightly more than the damage the New Justice Team caused to the museum, but they never actually caused any of the damage. It was all caused by the Zookeeper and his animals. However, if the New Justice Team had not been there, the Zookeeper might not have needed to summon his animals that caused the damage. The cream "may cause super powers in humans", but Leela is a mutant. Mutants are humans with altered DNA. Since Leela is unusually normal for a mutant she was probably human enough for the cream to work. Translation: Keep out of reach of children under the age of five hundred. For best results, sacrifice a small mammal xanroc, then apply evenly to interior of eyeball. Would you like to sell Dr. FlimFlam products? Contact a representative at a covered wagon near you. This page was last edited on 19 July 2017, at 13:25.